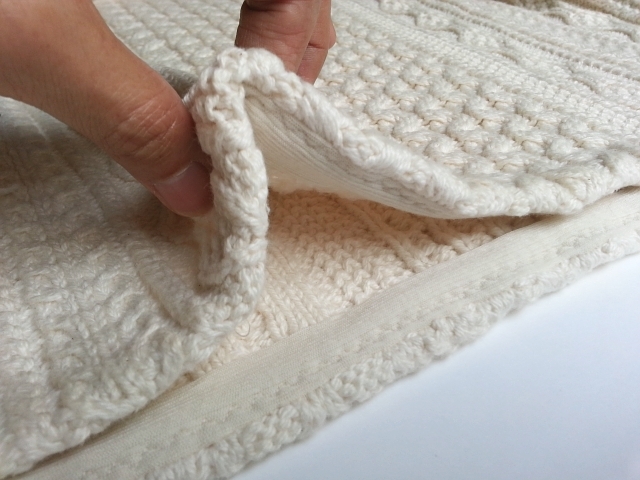 If I'd been using the beautiful fisherman cable knit fabric panels the way the designer had intended, it would have been an extremely quick project -- an unshaped sweater, pattern pieces easily aligned and cut along vertical motifs of cables. I assume the panels were originally designed to be cut and sewn quickly and accurately. With this fabulous Aran-style stitch design, I know I would have loved the result. I'm not sure why I often choose the more complicated route. This time it started when I decided to use a slightly shaped sewing pattern that I'd been wanting to try out for almost a year. 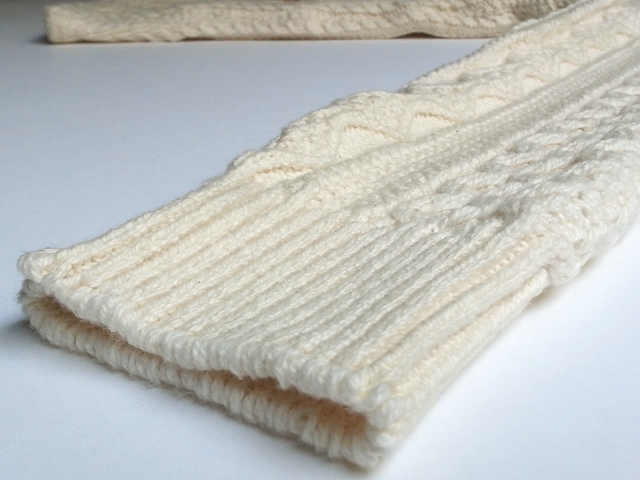 I used the sweater panels' original ribbing as rib cuffs on the sleeves, as seen above. But I cut off the ribs that were meant for the bottom of the sweater and went instead with a ribless hem. (Ok, not entirely ribless. There's a fly weight rib fabric, used as hem facing, invisible on the public side. I'll get to that shortly.) As I blogged previously, I used a column of cutaway cable stitches to make a fancy neckline. It's not that I'm disappointed with the hem. It's just that now my removal of the ribbing seems so pointless. I believe I was unduly inspired by this lovely design and this one and thought I'd come up with my own fabulous asymmetrical hem or shirttailed sweater. But after several delays to my sewing packing up my workspace in preparation for much needed floor repairs; restoring the workspace after the floor was repaired; and then a couple of days sitting in the jury pool; and keeping up with the knit business half the night; inspiration left me. I just wanted to finish the darn thing. So with ribbing already cut from my sweater, I chose to make a plain hem. At least I have the cut off ribbing and pretty seed stitches saved for another sweater some day. And I didn't leave the edges raw as in this cowboy's sweater, spotted on my way home from jury duty. 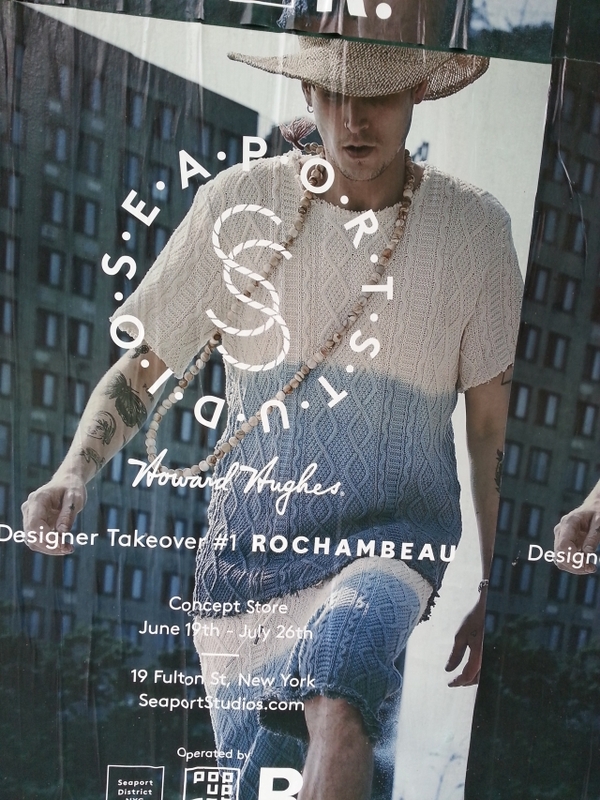 Click pic for a closer look at the Rochambeau ombre cable sweater and shorts. Ok, enough on what could've been! I'm happy to report that my new sweater has been completed. It's been washed and is air drying as I write. And I really do enjoy sweaters that just start their business at the bottom without any ribbed introduction, sweaters that begin with just a plain hem or thoughtful bound edge. One day I'll let my frayed edges show but not this time. When hemming a medium to bulky sweater knit fabric, I've found that it's important to use some sort of facing. In the past I've used lingerie elastic on medium weight sweaters and interfaced lightweight jersey on bulky ones. This time I used stashed flyweight rib fabric. This is how I did it. My facing fabric is really very thin and very stretchy and so I cut the facing opposite to the "usual" way. That is, I cut the facing, so that the least stretchy direction is what's going around my body. Also I cut the facing twice as deep as necessary (so I could double the thin facing) plus added seam allowances. Click diagram to enlarge, if needed. Next I sewed the short ends right sides together, trimmed the seam allowances, and pressed them open. I folded the facing wrong sides together. Then I sewed the raw edges of the facing to the bottom raw edge of the sweater (right side of facing to right side of sweater) matching quarter marks on the facing to side seams, center front, and center back on the sweater. I steamed the seam allowances toward the facing and stitched the seam allowances to the facing with a 3-step zigzag. After turning under the hem and steaming again, the folded facing made a good edge for blind stitching the hem. Last edit 19Mar2016. Rib fabric source no longer available. Interesting tips! Using lingerie elastic in a hem is so clever- I bet that really adds a lot of stability and recovery. Fantastic idea!